VBA CheckBox Properties helps us to perform different tasks to deal with CheckBox object control. 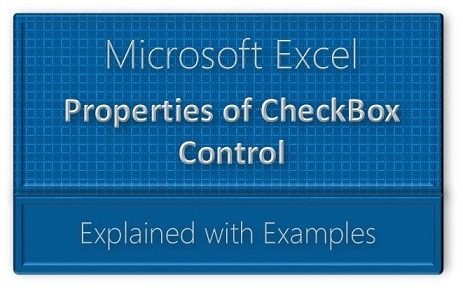 For example, we can sets the backcolor or back style or alignment etc properties of the CheckBox .Explore the various Properties and examples on Excel VBA CheckBox control properties using side navigation. Below are the most frequently used Excel VBA CheckBox Properties. Alignment: To sets the position of the CheckBox control. BackColor: To change the back ground color of the CheckBox control. Caption: To describe the checkbox control. Enabled: To represent the user focus on the CheckBox control or not. Height: To sets or gets the height distance of the CheckBox control. Left: To align the CheckBox left position. TextAlign: To align text in a CheckBox control. Width: To sets or gets the width distance between the CheckBox control.